Editor’s Note: Upon reading this post, some readers may say, “Oh, it’s just a movie!” Indeed, but stories, whether in books or movies or television programs, teach us about ourselves, about what we value, about what we love, about what we hate. Recently, I rewatched the latest Star Wars film, “The Force Awakens,” and noticed in particular how the FN-2187 character makes an emotional journey from a stormtrooper of the military dictatorship of the First Order toward his true, compassionate, and brave self, Finn. His emotional path is similar to the one taken by an awakening adult survivor of emotional child abuse. And so, I thought to explore 11 of those commonalities in an article. Like many abuse survivors, Finn’s awakening isn’t necessarily one event but a build-up of myriad small horrors. Finn (we find out later) was very young when he was stolen away from his family. He has spent his life in training and being programmed. He also has witnessed horrors and slaughter that the First Order inflicted. However, what snaps him out of his compliance is a particular tragic event. When on a mission on the planet Jakku to get part of a map of Luke Skywalker’s location, Finn witnesses the First Order’s attack and massacre on civilians at the village of Tuanul and the death of a fellow stormtrooper. And he is rattled awake. Real-life equivalent: Adult survivors of emotional child abuse have a lifetime of terrible, heart-breaking experiences… but because of being born to emotionally abusive parents, they endure so much without rebelling against the family. Often, however, something will happen—e.g., the adult survivor has a child and realizes the truth of their own childhood, someone “on the outside” makes a comment about the abuse, etc.—that startles the adult survivor awake. After Finn makes the decision not to participate, he is in a daze. He looks around in horror and confusion at the slaughter around him. But he is not the same. And he cannot act the same now that he knows the truth. Real-life equivalent: Adult survivors in the beginning of their awakening often feel surges of panic, confusion, and fear… These emotions can stem from post-traumatic stress disorder. Put simply: Adult survivors are freaked out by the realization that they have been emotionally abused their entire lives. They have been so programmed from childhood (like Finn) to comply and yield their will to those in charge that, once awakened, adult survivors stumble in shock. When ordered to slaughter civilians, the stormtroopers do so unquestioningly. None of them hesitate. He exerts himself as an individual, a person separate from the brainwashed collective of the First Order’s stormtroopers. He does this despite the fact these stormtroopers (rather than clones) have been “programmed from birth”—according to General Hux of the First Order—to be compliant and obedient to the First Order. And so, he holds his blaster but does not shoot it. Real-life equivalent: An adult survivor of emotional child abuse who has awakened to the truth will find the situation almost unbearable. (“Almost” because some adult survivors go “limited contact” rather than “no contact” with their abusers.) The truth about the parent-child relationship makes it so that the adult survivor is uneasy and can no longer participate in the relationship in the same manner that he or she once did. A commander of the First Order, Kylo Ren halts when he passes Finn amid the chaos. His attention is on Finn, noting his lack of compliance, and then Kylo Ren continues on. When Finn and his fellow stormtroopers are back on the Star Destroyer Finalizer, Captain Phasma of the First Order orders Finn to turn in his blaster, so she can see whether he fired his gun at all. She also commands him to report to her for reconditioning, so he can better follow her orders. The First Order wants complete compliance. Not a flicker of hesitation. Not a moment of thought. Obedience must be swift, must be unthinkingly carried forth. Real-life equivalent: Emotionally abusive parents want a dictatorship in their home. They do not want any personality from their child. They do not want children who struggle, who doubt, who question, who hurt, who feel. These abusive parents just want to issue orders and have those order unflinchingly followed. And abusive parents want more than just their rules followed—they want their child(ren) to only do the will of the parent. For example, an emotionally parent may want his/her child to be a super-athlete, and so the abusive parent will not tolerate anything in the child (such as musical inclinations, a lack of aggressiveness, a non-competitive spirit) that does not directly relate to the abused parent’s goal for that child. The abusive parent does not recognize the child as a separate being but only perceives the child as an extension of himself/herself or a mirror or nuisance. Finn is desperate to leave, desperate to be his own person and not a servant to the First Order. Faced with an evaluation and possible reprogramming, Finn decides to desert the First Order. He frees the Resistance pilot Poe Dameron from his cell (Finn needs a pilot), and they steal a Special Forces TIE fighter and escape. In the process, Finn takes out some of his former comrades, sealing his fate as a “traitor” to the First Order. Real-life equivalent: Once awakened to the truth, an adult survivor will want to have some breathing room to think about has been revealed. Every adult survivor needs time to process, and to do that processing in a quiet, safe place. He calls himself FN-2187, a rank and number assigned to him by others in power. As a young boy, Finn was stolen by the First Order. He’s not given a name (unlike other people in the First Order who must be addressed with honor and respect and titles, such as Captain Phasma). And that is all right with the newly named Finn. Real-life equivalent: Adult survivors of emotionally abusive parents are not really seen for who they are but who their parents assume they are or imagine them to be. They are forced into designated roles and controlled, manipulated, and abused into remaining in that role. At the beginning of the film, Finn is wearing a storm trooper’s uniform, assigned to him by the First Order. A short while later, once again on Jakku, assuming Poe has died in a crash, Finn takes Poe’s jacket and wears it. When Rey asks him whether he’s a member of the Resistance, he says yes repeatedly. He wants to be that for himself, for her, for a million different reasons. So, he pretends to be a Resistance fighter and eventually really does help in the fight against the First Order, all while he still plans to run away as far as he can from the military dictatorship. By donning the jacket of a rebel against the First Order, Finn expresses who he wants to be. In time, Finn grows into this role. Real-life equivalent: Adult survivors of emotional child abuse often find themselves at a loss regarding who they really are—without their abusive parents’ input, without the negative voices in their head, without worrying about what their abusive parents will say. Adult survivors often relate having to revisit what they were told they weren’t good at (“You’re not very graceful, you can’t possible like dancing” or “You were never good at numbers. What makes you think you can study accounting?” and so forth). This awakening process is, by its nature, very revelatory. When escaping in an X-wing, Poe tells Finn that they must return to Jakku. Finn hates the idea, but Poe says that BB8 has a map leading to Luke Skywalker that needs to be protected from the First Order. Finn knows what must be done. He doesn’t ask who Luke Skywalker is nor does he ask what must be done. Later in the film, when introduced to Han Solo, Finn asks Chewbacca, “Wasn’t he a war hero or something?” Again, Finn knows about the Resistance, and he has kept informed of its heroes. Real-life equivalent: Just like abuse is gradual (often worsening with age), the awakening to the truth is also a process. An adult survivor will slowly begin to piece together all the pieces from a lifetime of abuse—the time that her mother screamed that she was worthless because she forgot to put the dishes away, the time that his father gaslighted him a school event, the time that her father didn’t talk to her because he said she was useless, the time that his mother called him an idiot for wanting to do something independently from the family, etc. All the pains and sorrows and abuses fit together, the broken pieces forming a mosaic of the true nature of the abusive parent-child relationship. Not limited to expertly wielding blasters and also handling light sabers, Finn shows moxie. Even when he is being dragged physically through the Millennial Falcon by the Rathtars, he shouts, “Get off! Get off!” and punches and fights against the Rathtar. He doesn’t just scream and succumb to a terrible death; he fights against the monsters. 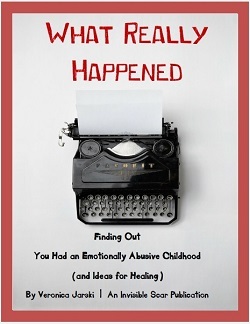 Real-life equivalent: Though adult survivors of emotional child abuse will often berate themselves upon their awakening (WHY DIDN’T I REALIZE THIS BEFORE? WHY DIDN’T I SPEAK UP FOR MYSELF YEARS AGO? ), an adult survivor is a fighter. Something in the abused child knew that something was terribly wrong. And though the abusive parents tried to smother that personality, that strength of character, they could not do so. The strength of the adult survivor, the power of truth, fought through the years and years of abuse. The adult survivor is a fighter. Despite having lived life mostly as a stormtrooper under the dictatorship of the First Order’s Supreme Leader Snoke, Finn shows remarkable kindness and compassion. The First Order was incapable of tearing out those traits from within him. When Finn first sees Rey, she is involved in a kerfuffle, and he’s ready to jump into action. (It hilariously backfires on him, but he was completely ready to help!) Also, when he and Rey are blasted to the ground, he asks Rey, “Are you OK?” rather than think of himself. Much later, when an unconscious Rey is being carried away by Kylo Ren, Finn—who has sworn time to never, ever go back to the First Order, who has told everyone to run away from this evil system—runs toward Kylo Ren. And he doesn’t only run… He screams, with his heart in his throat, for Rey, uncaring that his mortal enemies are before him. Even more heroically, Finn manages to go on a mission with Han Solo and Chewbacca to the superweapon Starkiller Base—with the main purpose of rescuing Rey from the First Order. Much later, Finn shows exceptional bravery and concern for his friend when Rey is injured in a fight with Kylo Ren. Finn uses the light saber that Rey has been carrying and fights Kylo Ren, despite his being far more experienced with a light saber. Real-life equivalent: Adult survivors of emotional child abuse know loneliness and sorrow—but they can still show love, comfort, and kindness to others. In many, many scenes, Finn is looking around, taking in the world, studying the different beings within it. He’s also trying to sort out who trustworthy people are… and who not to trust. He asks a lot of questions. Finn also describes himself in different terms. He tells Rey that he is part of the Resistance. He later tells Han Solo that he’s a “big deal” in the Resistance. When he’s trying to convince Rey to run away with him rather than fight the First Order, he says, “I’m a stormtrooper.” Much later, when he, Han Solo, and Chewbacca are on mission, Han Solo asks Finn what he did, and Finn says he was in sanitation. Real-life equivalent: An adult survivor of emotional child abuse will feel like his reality is crumbling all around him. What the adult child believed may be so very different from what actually is. And so, the adult child will begin to process life and experience it in a new way… It’s as if they are given glasses that brings the reality of life into focus, and the survivor will see more of what is good, what needs to be healed, what needs to be felt, what needs to be experienced. At first, an awakening will be difficult, and dark times will threaten to overshadow the adult survivor… In time, however, there will be healing. And the world will be so much richer and far more beautiful than the adult survivor could have imagined. In the Star Wars film, “The Force Awakens,” the former stormtrooper Finn escapes the cruelty of the military dictatorship The First Order, and in doing so, he is able to exert his independence, fight for what he believes in, form healthy relationships (such as his friendship with Rey), see new worlds, and start to become the person he wants to be. If you haven’t seen the movie “The Force Awakens”—and even if you’re one of the millions of people did see it—consider giving it another viewing. This time, focus primarily on Finn and watch his interesting character arc within the film. The comparison of Finn to an adult survivor of emotional child abuse isn’t a perfect comparison, no. The film wasn’t written from that viewpoint or with that intention necessarily. But I hope that the comparison does encourage you to look at your own path of awakening and inspire you to keep on the path of healing. Stay strong in the truth. Brilliant. I never would have put the two together, but as sAW fan and a survivor (1 year) this makes total sense. Thank you! I love this analysis. I’ve been struggling a lot lately. I relate ridiculously well with number 11, much to my frustration. I grew up believing that a person’s job/occupation is a person’s identity and my jobs have been many different types and because I’ve never been happy within, I’ve been miserable in each and every single job I’ve ever held. I was not nurtured or given any sort of direction of something to focus on and I had no idea what I wanted to do…still don’t really and as a result, since I equate the job (and what you do) to identity, it’s been a real struggle. So this issue also winds back around to number 7 as well. As for number 8, I just want to add that those put downs don’t always have to be straight up. They can be covert and insidious underlying messages that are never actually said verbally but are delivered in such a subconscious way from the way you are treated. I was told numerous times that I could be and do whatever I put my mind to. My father called me beautiful when he greeted me almost every day. But there is more to this whole thing than what comes out of their mouths. Besides many abusive things did come out of his mouth too, just not direct insults. Usually it was a mix of what was being said, tone of voice and body language. My father was someone to walk on eggshells around for sure. Wow! This analysis is absolutely amazing! This has been my experience to a tee. Fantastic rundown. I can relate, and so I write. You know, I would say that Rey also has things in common with emotional abuse survivors, though they are not the same as Finn’s. For starters, she waits on Jakku (a horrible circumstance) for parents who will never return, while putting up with a horrible boss who consistently moves the goalposts and demands more effort for the same amount of food. I would think Rey feels both that she has a duty to wait for the ones who left her there and that she will only be able to be truly loved by the ones who left her there; nobody on Jakku is really loving towards her, as they are all looking out for their own self-interests. Furthermore, Rey improvises things and teaches herself various skills, like fighting, so that she can survive and even maintain some dignity in her undignified circumstance, sort of the way certain emotionally abused kids will improvise ways to do certain things, and, if there is a skill they believe they cannot do, whether that is true or not, they will try to work at another skill they do have so they don’t feel devoid of talent; also, whether or not they learn to fight physically, they will learn at the very least some kind of psychological fighting skill, and they may learn at some point in life that they have a surprisingly good eye for what real fighting looks like, even if they are not actually that good at physical fighting (although, as a person who has done those things, I may not have been all that good at physical fighting but I nevertheless accidentally managed to break an old but sturdy wooden towel rod with a karate chop). Sometimes, they may in certain harsh circumstances also try a skill they think they have a chance at with a “What the hell, I’ve got nothing to lose” attitude, much the way Rey experiments with the Force. In short, both Finn and Rey are like abuse survivors, unlike Luke Skywalker in A New Hope, who seems to have had a really healthy, although not exactly exciting, childhood (although bullseyeing womp rats from a T-16 “back home” sure as hell doesn’t sound boring to me), and of course, Luke Skywalker’s trauma does not begin until he is a young adult; nineteen, to be exact. And of course, I don’t think Uncle Owen is necessarily being intentionally abusive when he says he needs Luke, because he is a farmer with 19th century attitudes who legitimately needs all the help he can get; any abusive effects experienced by Luke, if there are any, which I doubt given that Luke acts like a typical bored teenager, would have been a consequence of necessity rather than a deliberate attempt to sabotage Luke. Speaking of which, as a survivor of emotional abuse by teachers in the special ed school system that was given accidental support in some areas by parents who were nonabusive but ignorant of what the teachers were doing because I thought they would side with the teachers, I relate to Rey for the reasons I mentioned above, although of course Finn was emotionally abused too, and by an institution. what a great article. i’m a child/adolescent therapist and your analysis of finn in relation to emotional abuse is spot on.